“Summer afternoon—summer afternoon; to me those have always been the two most beautiful words in the English language.” – I agree with Henry James and what is even better is Saturday Summer Afternoon! 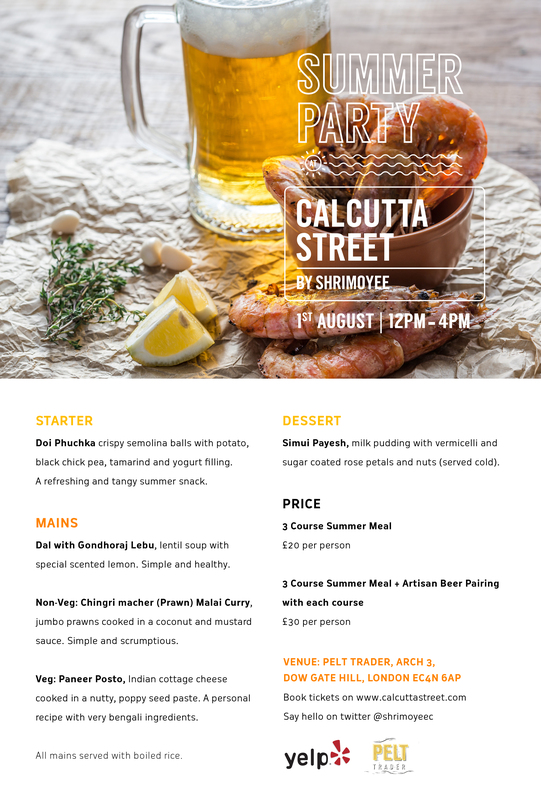 We are celebrating 6 months of Calcutta Street with a Summer Party – 1st August, Saturday 12pm – 4 pm at Pelt Trader craft beer bar in the city. The menu is very Summery and fresh with goodies like Prawns, Lentil soups, Yogurt, Tamarind. It is a 3 course menu with artisan beer pairing with each course. Yes, you heard that right – craft beer pairing with Indian food! Mark from Pelt Trader does know his beer really well and I am excited with the pairings he has done. There will also be live music by the very talented blues and country singer Charlie Walker! This Pop up is also right after my 26th Birthday (Yes, I have stepped on the wrong side of 20) so you can always drop by to wish me Happy Birthday and try my special dessert – my mum used to make this for me on every birthday of mine. I am making few of my personal favourite dishes like Prawn Malai Curry, Simui Payesh (Kheer), Doi Phuchka, Paneer Posto. I am certain you won’t find most of these dishes in any London restaurant. Doi Phuchka, Crispy semolina balls with potato, black chick pea, tamarind and yogurt filling. Very refreshing and Tangy – perfect for a summer snack. VP or Vivekananda Park in Calcutta has some of the best Doi Phuchka stalls where most bengali youngsters crowd every evening for the tangy snack with some lebu cha (lemon tea) and a cigarette or some good old grass. Every bengali’s comfort food and a bengali meal is never complete without a serving of Dal and Bhaat. This is the simplest dish ever but very few people get it right. Chingri macher (Prawn) Malai Curry, Jumbo prawns cooked in a coconut and mustard sauce. This is every bengali’s favourite Sunday lunch, no special occasion is complete without this dish. When Rick Stein travelled to Kolkata, he picked this dish as his personal favourite.Prawn is called chingri in bengali. Paneer Posto, Indian cottage cheese cooked in a nutty, poppy seed paste. This is my own recipe with very bengali ingredients. Contains nuts. The most famous poppy seed or posto dish in Calcutta is Aloo Posto, potatoes in poppy seed paste. This is also the favourite dish of Saurav Ganguly the famous Indian cricket team captain who took his shirt off at Lords when India won a match against England and then eventually got suspended. All mains served with boiled rice. Since this Pop Up is right after my birthday, I decided to make the dessert which my mum made for me on every birthday of mine. Payesh is a must on birthday’s its meant to be auspicious. Mocktail: Aam Pora Shorbot – Smoked Raw mango pulp blended with a spice mix. Perfect cooler on a hot summer day. Cocktail: Aam Sura – Aam pora with bacardi. We also shot a little video with some of my customers and people who have been associated with Calcutta Street in any way. I am hoping to see some of you on 1st and please do some and say hello! Ciao Shrim and greetings from San Francisco! How are you? Let me first say that we have got to find a way for you to have your own food channel on television. You are photogenic, funny, creative, informative and so good at what you do. I remember you from your early days of blog writing and to see you now. Poised and professional. What an exciting adventure you have had. Well, I just wanted to stop by as I sometimes do and say hi. Awesome job. Bravo!